Voalte, the maker of communications tools for hospitals and other health organizations, will be acquired by Hill-Rom Holdings, which provides various technology and equipment for hospitals, for $180 million. The deal also includes potentially an extra $15 million, pending the company’s achievement of certain performance milestones. Voalte, founded in 2008, is a leading provider of real-time, mobile communication technology for hospitals and health systems. The Hill-Rom deal will enable enhancements and improvements to the capabilities of its communications platform, officials said. Hill-Rom, for its part, used the “I” word when explaining its rationale for the acquisition of Voalte, whose annual revenues are about $40 million. “Interoperability and connectivity have become critical elements in providing quality healthcare, reducing length of stay and driving efficiencies across the healthcare continuum,” said John P. Groetelaars, president and CEO of Hill-Rom. The deal will help enhance deliver of “connected care to improve workflow and real-time actionable insights at the point of care,” he said. Sarasota, Florida-based Voalte has more than 200 healthcare clients, with more than 84,000 mobile devices on its platform connecting some 220,000 providers with voice, alarm and text capabilities. That platform will be integrated with Hill-Rom’s care communications business. This past year, KLAS published a study showing that secure text technologies are evolving into full-fledged platforms, streamlining enterprise-wide communication. 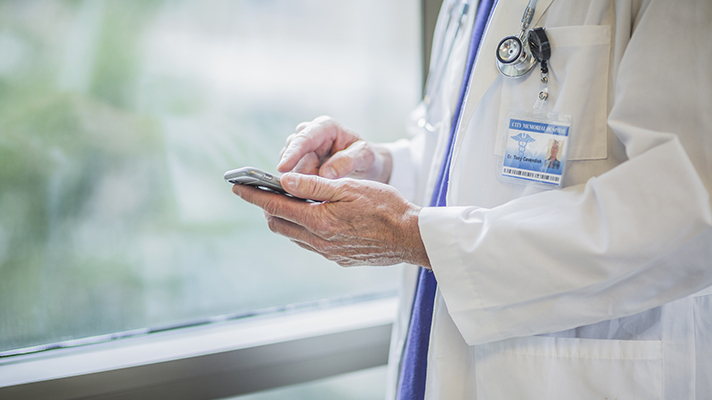 A similar 2018 study from Black Book showed that many hospitals are making big investments in those clinical communications platforms as the benefits of secure texting – for patient safety, data security and more – become apparent. We also reported on one case study where Sioux Falls, South Dakota-based Avera Health was able to gain some big efficiencies by deploying a Voalte platform for texts, alert notifications and voice calls. “Our scalable enterprise communication platform is proving to be a critical tool in the digital transformation of healthcare systems, and we look forward to further developing our platform in alignment with Hill-Rom’s vision of advancing connected care,” said Voalte CEO Trey Lauderdale in a statement. “Bringing our companies together will allow us to offer customers a single, integrated solution – delivering actionable data from smart hospital beds, nurse call and patient monitoring technology right to a caregiver’s mobile device,” he added.